Who doesn't LOVE IKEA? 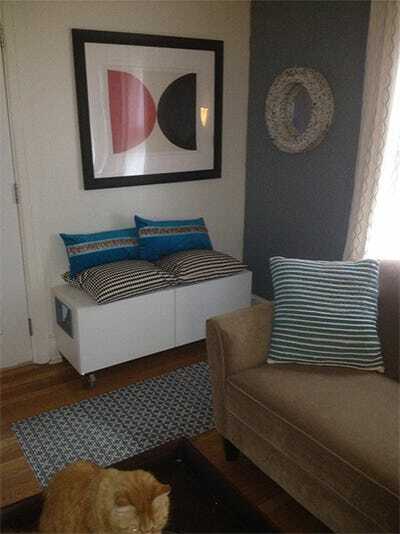 Furniture that is trendy and affordable, and a source of inspiration for DIY-ers everywhere. This doesn't stop with you, cat lovers. Try a few of these and your cat will love IKEA as much as you do. Feel threatened by tools? 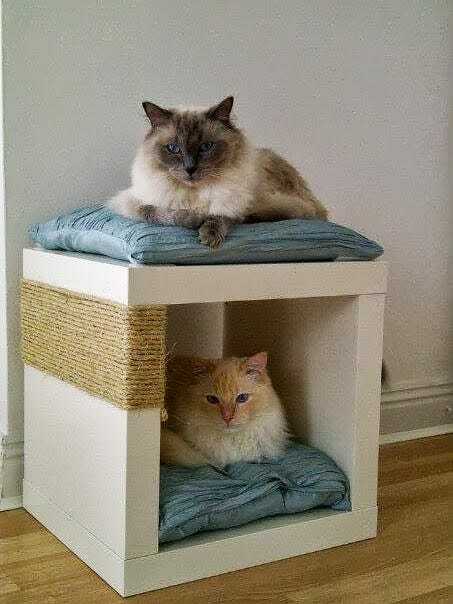 Some of these cat DIYs are so easy, you can try them even if you are LACKing in building skills. 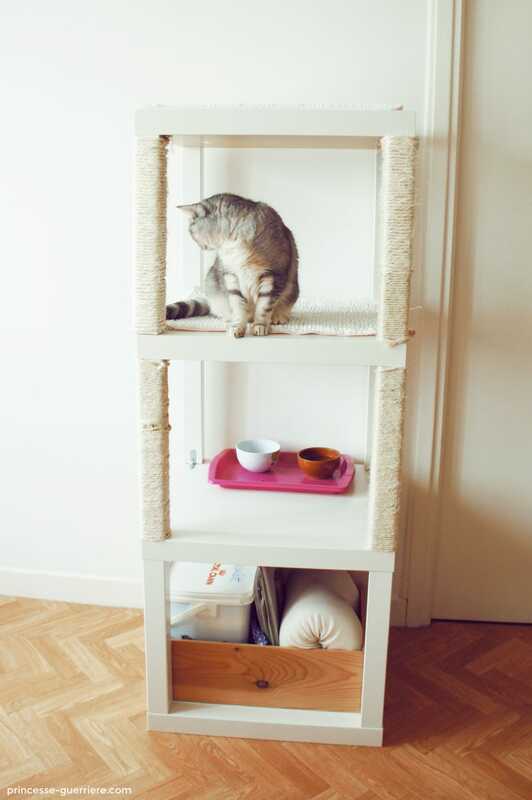 This IKEA cat hack uses minimal effort (and money) for a big pay-off. 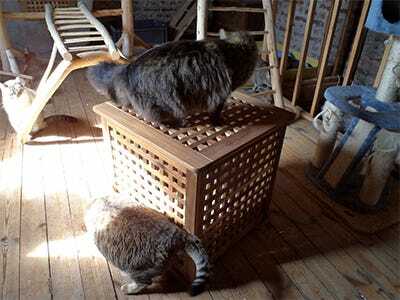 Most of the simple DIY projects for cats that you see out there just don't have the SIZE and height that this one does. 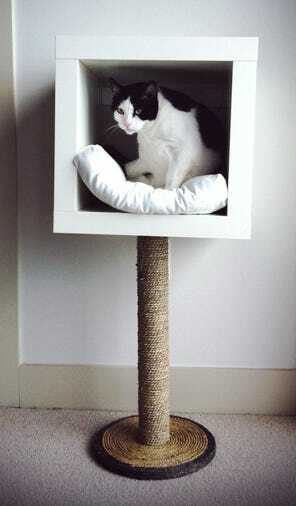 You definitely need the space for this cute cat tree, but its simple style can be accomodated in any decor scheme. And, at only $12.99 per LACK side table, its super cheap, too. There are a lot of litter box hiders out there, but I love this one for how simple and sleek it is. The cabinet doors make for easy cleaning and the caster wheels keep them portable. These slim, modern cat shelves are just right for your frisky, climbing kitty. 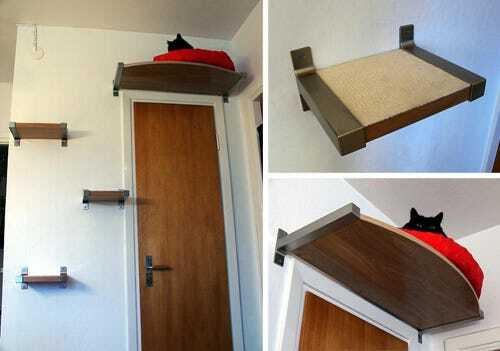 Perfect for small living small with no space for bulky cat trees. Favourite part? The over-the-door cat bed. Or how about placing yours near a high window? How adorable is this cat nest? AND, not to mention, it's a simple DIY if you have some basic sewing skills. Take two GOSIG baskets (I think these were discontinued, but any pet bed or soft basket will do) and sew together using a blanket stitch. Not a DIY-er? THIS is for you. This IKEA Cat Hack has to be one of the easiest DIYs I have ever come across, but the best part about it is that it is very functional as well. All you need to do is wrap and secure sisal to make this a lovely kitty haven and mini scratch post. 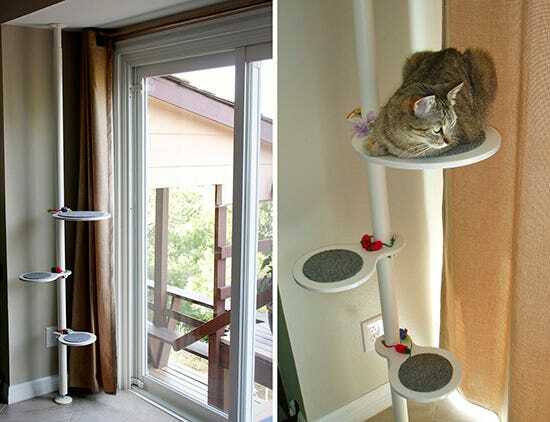 This cat tree and scratcher would fit beautifully into any modern decor. And its a simple hack that would be easier for even a beginner DIYer. My only concern is the stability of this piece. I would suggest anchoring this one to the floor or wall or somehow giving it a bit more weight at the bottom, particularly for larger cats. Wait...elegant litter box? Some things just don't go together. 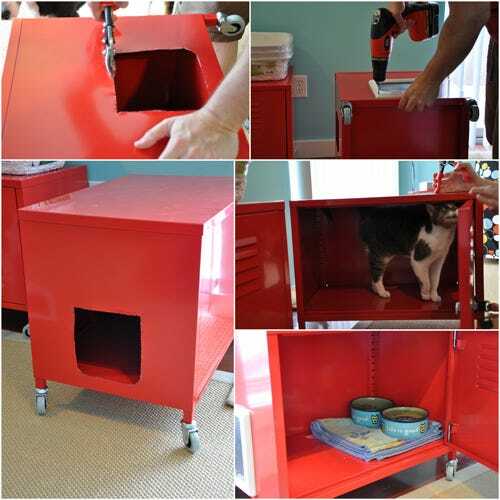 But your cat's open litter pan and this modified IKEA unit? YES. The result truly is elegant. While you may not want to have this in your living room, it still makes a better-looking addition to your laundry room, or wherever you keep your cat's litter pan. If you have a jigsaw and know how to use it (or know someone who does), this cool IKEA cat hack is for you. Custom design your own shelves and add them to the STOLMEN poles (from an IKEA closet storage unit), and you have cat climbing shelves to the ceiling! This unique cat tree design is space-conscious and nice enough to keep in your living room. Not the handy type? Get your own shelves build for the STOLMEN units from ContempoCat or Hollywood Franklin. The very best DIYs involve no work whatsoever - just clever use of creativity! The hard part is done for your with this simple IKEA cat hack. 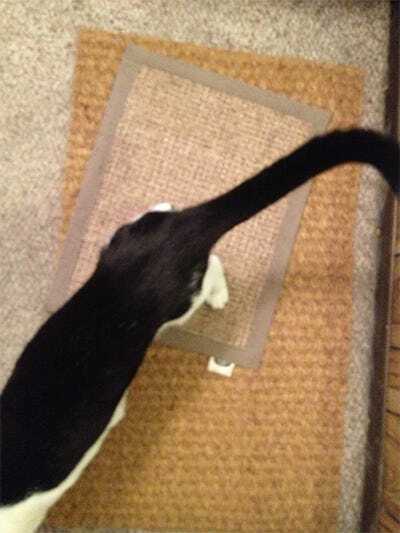 To replicate this non-slip cat scratch mat, just buy a SINDAL door mat from IKEA. Presto - consider yourself handy! This hack is very similar to #2, but I love the modern industrial twist. These lockers would make a bold statement in a stylish apartment as well as hiding the litter box or the cat's food from any canine friends that may share your house. love the use of cat doors, as well. That would keep smells down to a minimum. What's your favourite IKEA Cat Hack? Or do you have your own? Share!